First cut and separate 12 large squares of aluminum foil over a flat surface. Place the potatoes, chorizo, and the rest of the ingredients in a large bowl. Stir to evenly combine the ingredients. Use the remaining six squares to cover and seal the packets. You can use an extra piece of foil to double-cover the packs for extra strength, if you like. When finished cooking, remove from heat and use a fork to pierce each pack. This will let the steam out and help the packs to cool. Still, beware when opening, any steam released will be very hot! The chorizo can be switched for bacon or vegetables only, like mushrooms,for vegetarians. Without a doubt, summer is in full swing. It's time to shake out the tent and set-up camp! When I was little, I loved to go camping. Some of my best childhood memories come from eating around the campfire with family and friends. I think that cooking over a wood fire somehow creates an extra special and sabroso meal, most of all when served after a long hike in the forest. 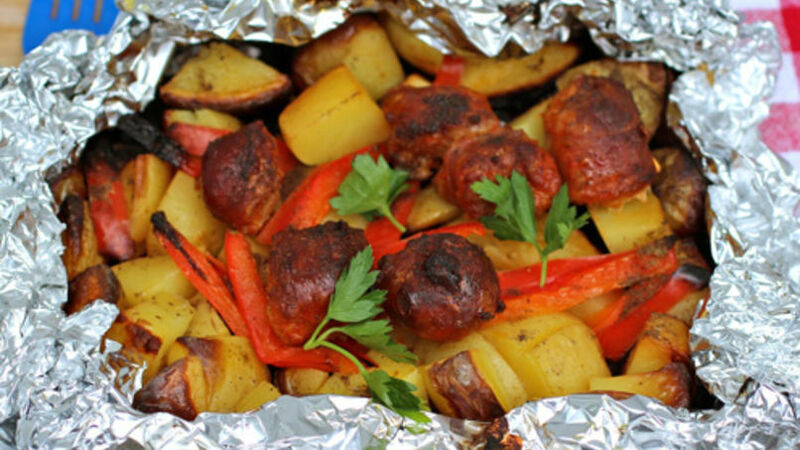 These potato and chorizo packets are the perfect dish for cooking at camp; they're very simple to make, but more importantly delicioso. What are your favorite meals to have while camping?